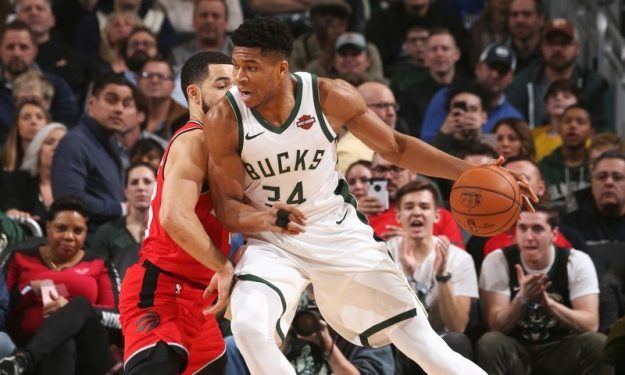 Giannis Antetokounmpo had a big game on Saturday, but didn’t prevent the Milwaukee Bucks from losing to the Toronto Raptors. Giannis Antetokounmpo made three shots beyond the arc on Saturday night, a couple of them in the fourth quarter, but he couldn’t rally the Milwaukee Bucks to the win against the Toronto Raptors. The Greek Freak finished up with 43 points with 13/20 two-pointers and 3/5 three-pointers, also notched 18 rebounds, four assists and one steal in 40 minutes. Per Elias Sports, Antetokounmpo became the second Buck in history with a 40-point, 15-rebound game. However, Kareem Abdul-Jabar achieved this feat 33 times.